Well, Big Sis has now officially been an 8-year-old for a whole week. 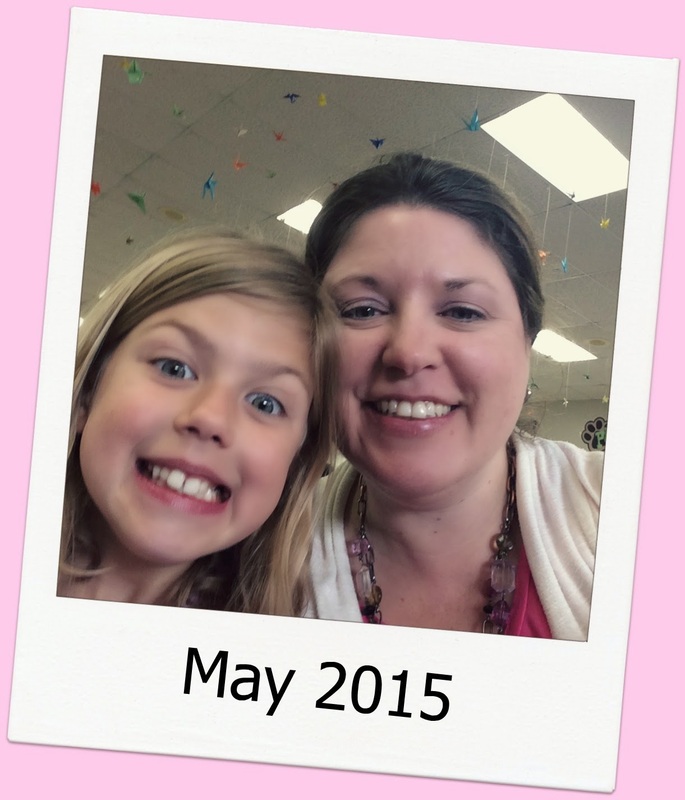 It's hard for me to believe that my first tiny baby is now such a big kid. One of our favorite places in town is The Jones Center, so I got online to check out their birthday party options. 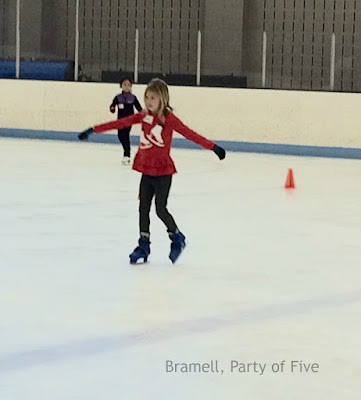 Immediately, I thought she would choose an ice skating party since she'd just finished a session of ice skating lessons there this winter. I thought it was a very fun, affordable choice--you can have a party room, a skate lesson with a teacher and skate passes for 15 kids included in the package. But, Big Sis said she wanted something different. The Jones Center also has a huge indoor pool and pool party packages--either during public swim time or private rental--that are also easy on the budget. Since we've had our membership at The Jones Center, we've spent A LOT of time in this pool. 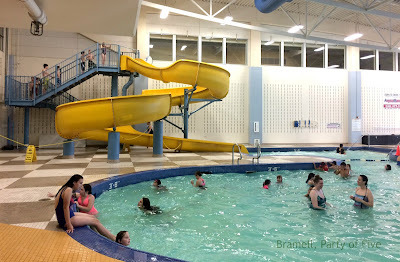 The kids absolutely love the giant slide and I love that we can keep them entertained and busy all year long in the pool. As for a party, Big Sis decided that she swims there so much that she wanted to try the other choice we looked at. 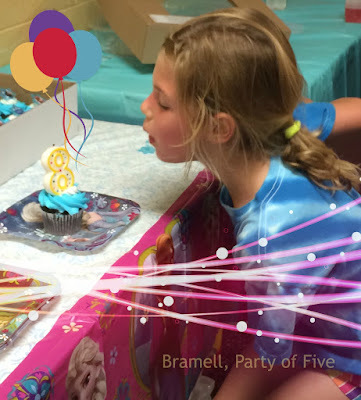 She chose a birthday party in the Gymnastics Studio, and it was perfect for us. We were able to rent the room for 1.5 hours and have access to tumbling mats, balls, ramps and other tumbling "tools." We had about 12 kids at the party and they had a blast! It was non-stomp romping, with only a small break for the Frozen-themed cupcakes that left everyone with bright blue tongues. Instead of birthday gifts, our friends helped us collect more than 10 pair of children's pajamas to donate to the local women's shelter. Here are some photos of the kids enjoying the Gymnastics Studio party. I totally recommend this for a party space for my local friends. To see all of the birthday party options offered by The Jones Center, click the link here. Make sure you tell them I sent you! 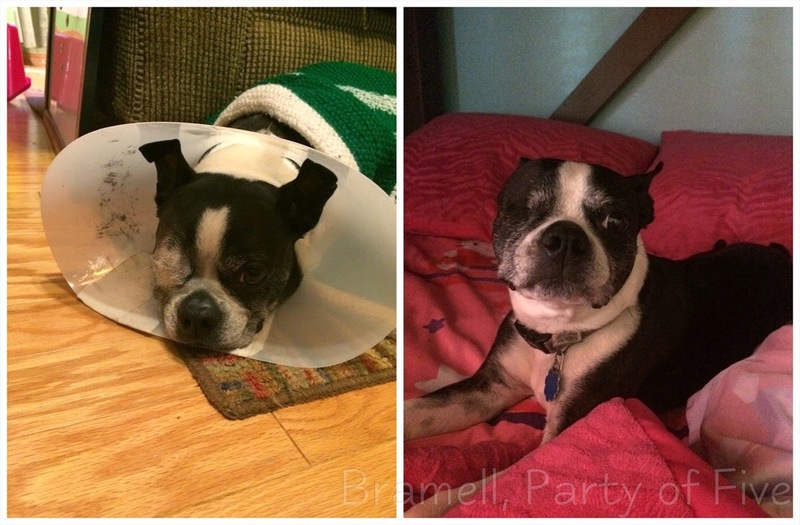 It's been two months since Fergie's surgery to remove her right eye. It was such a hard decision for us to make, but still the right one, we believe. After her injury in January, we waited and treated the eye with drops in hopes of a different outcome. Once the eye pressure went back up, the vet thought that she may be in pain--much like a human would have a headache. Rather than keeping her on pain pills and eye drops forever, we decided to have the eye removed. Fergie handled the whole thing like a champ, once she got over being mad at us. I'm not joking; she gave us the cold shoulder for a solid week before she caved. Of course, she hated wearing the cone for two weeks and bumped into everything in the house. Once the cone came off, she quickly got back to her old self. We still run and play ball like before. The only difference I've noticed is that she will take longer to judge distance now than before, but she's otherwise adjusted well. Here's our pretty girl post-surgery and now. PS: Girl Twin thinks we should adopt a one-eyed boy Boston to be her friend. LOL! Today is a special day for Big Sis...she's 8! Happy Birthday to our funny, smart and pretty big girl. Every day I notice something about her that I didn't notice the day before. She never sits still, she's all legs and she has blossomed this year socially. Sometimes I look at her and can't believe she's the same little girl I left crying in kindergarten just a few years ago. She loves to read, rides her bike like a pro and will climb on anything that's nailed down. 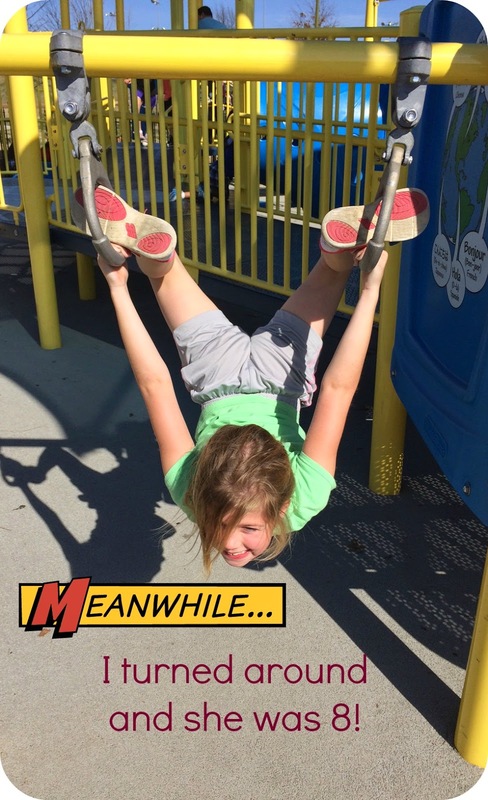 She's a great combination of Disney princess sweetness, Wonder Woman toughness and American Girl coolness. I'm so proud of this kid.